by mercury and by cyanide in the rivers and in the air distributed by the wind, and there are more substances of the explosives in the tunnels mixing with the water in the mountains. Mercury is a poison affecting and destructing the nerves. In the chemical world mercury is rated as "very dangerous" and "very toxic" with skull and bones as it's symbol which can be seen in the German article about mercury "Quecksilber" of Wikipedia. And one has to know that mercury also has got an effect in form of fumes, and these fumes are existing with normal house temperatures already, so from about 15 degrees Celsius upwards, and these fumes can contaminate the whole mining region, and the miners are always inhaling these fumes, and therefore they are poisoning themselves. Mercury is rated with skull and bones and with a "T+" (very toxic), add to this is rated "dangerous for the environment" killing trees and fishes, according to the rating of European Union, see the German article "Quecksilber" in Wikipedia. Question: How are the temperatures in a mine? Can be from 20 to 30 degrees Celsius (75-85 Fahrenheit) [web01], but when there are fires or blasting operations, then the temperatures are much higher and there are more toxic fumes [web02]. Well, mining is very poisoning. There are more damages by mercury, above all in combination with other metals, with amalgams etc. But for us here this is enough. People searching in the Internet can find more damaging effects by mercury. And the presidents don't know anything of this: And why the Presidents of South "America" and the Peruvian government want this dangerous mining? - Because they have their calculation tables and these problems and damages are simply not mentioned in their tables but they say that this would not be important! And why the enterprises of the Whites in North "America" and of Europe are offering this dangerous mining service? - Because they are racist and life of miners does not count for them in their calculation tables, and the damages simply are not mentioned in their calculation tables. It's not important for them either! 10. Compound 1080 [a pesticide]. Therefore mining is attacking the miners and the mining regions with the most dangerous substances rated as number 6 (cyanide) and number 7 (mercury). The web site "The 10 poisons" has put a skull to the cyanide. Cyanide with a skull on the home page "The 10 strongest poisons of the world"
(orig. Spanish: <El cianuro es una sustancia química, potencialmente letal, que actúa como tóxico a través de la inhibición de ciertas proteínas mitocondriales, bloqueando el Ciclo de Krebs, sistema central del proceso de respiración celular. Si bien su efectividad a bajas concentraciones es fulminante, el individuo muere bajo dolorosos espasmos y convulsiones que pueden tardar entre diez segundos a unos minutos.> (página "Los 10 venenos"). Add to this one has to know that a cyanide capsule is a method committing suicide within 30 seconds and all is over. In this way many generals and commanders made suicide at the end of Second World War. And when cyanide is getting into rivers all will be killed, and when cyanide gets into a lagoon or into a lake so all will be killed for 100s or years. <Cyanide is potentially mortal acting like a toxic blocking the citocrome-d-oxidase complex, and therefore it's blocking the transportation chain of electrons which is the central process of the cell respiration. As a consequence this provokes a low oxygen level in the cells blocking homeostasis of the cells. Also affects the transport of electrons by the channels because they stay with a negative load, and a positive environment is created inside the cell. This generates big quantities of charges that are enough energy for the conversion of AMP (Adenosin monophosphate) into ADP (Adenosin diphosphate). Therefore some processes are overstimulated. Principal effect of mortal and lethal variations of cyanides is the blocking of usage of oxygen in the red blood cells, oxygen cannot be used as aceptor of hydrogene any more at the end of the intramitocondrial respiration chain. In an autopsy the presented dead body presents big quantities of oxygen in the veins and a big quantity of lactic acid, product of anaerobic respiration by the cells which are without oxygen. The investigated chemical substances in the products on the base of acetonitrile used mainly for removing artificial finger nails can release cyanide when it's inhaled by accident and therefore can have a lethal effect by cardiac arrest. Cyanide is not persistent and has got no suffocating effect, because in nature it's well destroyed by action of the sun light (by ozone), descomposing by oxidation in gases of COx and NOx. It forms chlorates and nitrites which are well used in purification water plants with plumb polluted water. Environment board of the "USA" (EPA) rules that cyanide in the water is only allowed with 0.2 parts per million (0.2 ppm). European Health board (OSHA) is ruling that 10 parts per million (10 ppm) are allowed in the air of the working place. [But reality is another one and no mining enterprise is fulfilling the norms because otherwise mining would not be profitable any more]. El principal efecto nocivo y letal de las diversas variedades de cianuro es el impedir que el oxígeno portado por los glóbulos rojos pueda ser utilizado como aceptor de hidrógeno en el final de la cadena respiratoria intramitocondrial. En una autopsia, el cadáver presenta gran cantidad de oxígeno en las venas y una gran cantidad de ácido láctico, producto de la respiración anaeróbica realizada por las células carentes de oxígeno. El cianuro no es persistente ni asfixiante, ya que en la naturaleza se destruye por acción de la luz solar (por medio del ozono), descomponiéndose por oxidación en gases de tipo COx y NOx. Creando cloratos y nitritos muy utilizados en la purificación del agua contaminada con plomo. La Agencia de Protección del Medio Ambiente de EE. UU. (EPA) regula los niveles permitidos de cianuro en el agua potable por medio de sales de potasio. El nivel máximo de cianuro permitido en el agua potable es 0.2 partes de cianuro por millón de partes de agua (0.2 ppm). La Administración de Seguridad y Salud Ocupacional de U.E. (EU-OSHA, por sus siglas en inglés) ha establecido un límite para el cianuro de hidrógeno y la mayoría de las sales de cianuro de 10 partes de cianuro por un millón de partes de aire (10 ppm) en el aire del trabajo. [Pero la experiencia muestra que ninguna empresa minera cumple las leyes de otra manera la minería no sería rentable más]. <When there are bigger quantities of gold to win being possible to process it with industrial methods, so cyanide solution is applied. Gold can be dissolved as a complex chemical combination in sodium cyanide solution containing oxygen (sodium salt of cyanhydric acid HCN). Therefore [first the rock with the gold in it is ground into sand, and then] after having been ground into fine sand this sand is piled up and is trickled down step by step with the chemical solution added under free air. First the little gold metal parts are dissolved because they are reacting. The noble metal can be found in the chemical solution respectively is now dissolved in the absolutely toxic seepage water. After a filtration zinc is added precipitating the gold in the mud, and after washing and drying by a reduction the crude gold is worked out. Now follows the cleaning of the gold, and then refining of the gold being fine gold at the end, standardized and ready for the market. Cyanide solutions are always used again and again in the working cycle. But cyanhydric acid and their salts (cyanides) are escaping into the environment, partly also in bigger quantities when there are accidents, failures of the plant, floods etc. It's absolutely noteworthy that cyanhydric acid is already released from the chemical solutions by carbon dioxide in the air. All these elements are very toxic, but also easily decomposable. In nature they are degraded relatively fast by oxidation or by hydrolysis. Bei größeren Vorkommen, die eine industrielle Erschließung erlauben, wird die Cyanidlaugung angewendet. Vor dem Hintergrund, dass sich Gold in sauerstoffhaltiger Natriumcyanid-Lösung (Natriumsalz der Blausäure HCN) als Komplexverbindung löst, werden die metallhaltigen Sande staubfein gemahlen, aufgeschichtet und im Rieselverfahren mit der Extraktionslösung unter freiem Luftzutritt versetzt. Die kleinsten Metallteilchen werden hierbei zuerst aufgelöst, weil sie die relativ größte Reaktionsoberfläche haben. Das Edelmetall findet sich chemisch gebunden im hochgiftigen Sickerwasser. Nach Filtration und Ausfällung mit Zinkstaub erhält man es als braunen Schlamm, aus dem nach Waschen und Trocknen durch Reduktion Rohgold wird. Hieran schließt sich die Reinigung des Rohgoldes an. Raffiniert zu Feingold ist es dann standardisiert und marktreif. Die Cyanidlaugen werden in Kreislaufprozessen wiederverwendet. 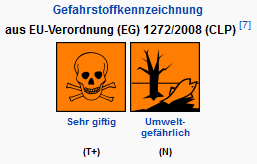 Dennoch entweichen Blausäure und ihre Salze (Cyanide) in die Umwelt, teilweise auch in größeren Mengen, etwa bei Unglücken, Fehlfunktionen der Anlage, Überschwemmungen etc. Erwähnenswert ist, dass Blausäure bereits durch den Kohlendioxidanteil der Luft aus den Lösungen freigesetzt wird. Alle diese Stoffe sind hochgiftig, allerdings auch leicht zersetzbar. Im Stoffkreislauf der Natur werden sie relativ schnell oxidativ abgebaut oder durch Hydrolyse zersetzt. Why is this toxic mining permitted in South "America"? Answer: Because the "catholic" presidents and governments with their ministers and their "catholic" moms in the ministerial boards and the "commanders" don't know anything of the mining dangers, because they don't read, and because they don't listen to the population, and because the mining enterprises are racist using the miners as their "material", and it's not important for these racist foreigners how they will leave the region, and it's not important for these racist foreigners how is damaged the health of the local population. And mining with mercury and cyanide is also permitted because UNO is not forbidding this mining because any state "wants gold", but considering all the damage which gold mining is provoking taxes are missing and the price for gold should be doubled or even tripled considering all the damage provoked by this kind of mining. All this also counts for mining in Africa and in Asia and in Russia. And now it's clear that any Bible is not protecting from pollution by mining. Only logic thinking and the energy of the Great Spirit is giving the big force correcting this destructive policy with a positive and integrative economy protecting the populations giving them the right for pure water and a pure landscape without pollution. Only logic thinking and the energy of the Great Spirit can stop this abuse of the populations and natives being abused like "material" for the racist mining enterprises. And there is missing much yet. We have to missionize the Presidents!!! Now how is working this really? When a mining enterprise indicates that they will build up a "retention basin" as a prevention for not polluting rivers and lagoons, so the problem is not at all solved because there can be accidents, and as we have seen in the text above there is wind distributing the cyanide dust in the whole region. A "retention basin" is only a "basin", but with mercury and cyanide these "retention basins" are a mortal and lethal trap. And at the end the enterprise is leaving the location leaving the basin there and they don't want to have anything with this mortal waste. That's why: MINING IS POLLUTING EVERYTHING - say no to mining. There are better works to do. All this damage is paying nobody of the mining enterprises but they think that they have no responsibility polluting Peru and other countries. And the President - not important from which political party - it's not important form him. And in a region like the Andes in Peru there are many earthquakes and a "retention basin" always can break off and all the "toxic soap" is leaving and all will be killed, and when lagoons and lakes are polluted nothing will live there anymore. One has to know: Miners normally are dying normally with a medium age of 55 years by the pollution of dust. MINING IS POLLUTING EVERYTHING - also the lungs of the miners. -- more or less all miners are dying at a medium age of 55 already and generally it's not at all a good life working as a miner, but THEY ARE SUFFERING. All this corporal damage is a big torture. In reality this is a kind of slavery without any right of health. All this damage is never paid by anybody of the mine enterprises, but they think that they have no responsibility polluting the miners of Peru and of other countries. Therefore it's better that nobody has to be a miner any more in his life. But the bosses of the enterprises are living well in the headquarters in other countries. And the President - not important from which political party - it's not important for him. Add to all what was mentioned before mining is a work far away from the population centers and there are no women or there are only whores, and when these conditions are lasting for some months venereal diseases are spreading because there are no condoms in a mine. It's logic that mining under these conditions for some months will destroy families and this is not at all "Christian" and not at all human, but this is an inhuman mental torture and the miners are only the slaves of the enterprises with their bosses in the clean headquarters in other countries. The Peruvians let themselves enslave for mining enterprises - that's it. This counts also for Africa, Asia, and Russia. All this damage with the miners is never paid by the mining enterprises but they think that they have no responsibility polluting Peru and other countries. And there is another fact: In the mines there is much alcohol and they arrange alcohol festivities with whores and there is not only the danger of loosing health thereby but they also are loosing much money from their salaries - spending it for alcohol and whores, and with all this they are loosing their brains more and more. They are more stupid than before because alcohol is systematically destructing the brain structures. And there is one more fact: When the fathers are working in mines far away from their homes with whores and beer loosing their brains and more or less are not at home with their families any more, then the children and their education is left without fathers, and not only the spouse is overcharged with the children, but the children are left vulnerable because the father's support is missing and the control of the boys between 6 and 12 years is missing. And when the father is converted in an "always drunk" as it's often the result, then any respect will be lost and it's for nothing when the father will build up a house after having worked in a mine but the sons will never have any respect any more with a father who was with whores for years and is drunken and screaming around without brain. And add to this any miner father has got a heavy lung damage and is invalid. This is not life any more for anybody, and therefore one can see that mining is not only polluting the environment but is polluting also families. The father is only suffering, the mother is only suffering, and also the children are only suffering. All are suffering. But the President - not important from which political party - it's not important form him. They don't speak with the miners about the real conditions. The Presidents are only considering their calculation tables in their documents. They don't see the sociological damage. But in Peru and in other countries - they call themselves "catholic" and "Christian"!!! - they are loosing by mining systematically human values day by day. And what a life is this for the whore girls in their cheap huts near the mines only waiting for their drunken miner "clients" with damaged lungs, when they made an alcohol festivity. Illnesses are included, and at the end the whore girls also loose their brains because of stupid life. Thereby the whore girls can send some money to their homes, and they are cashing much money from the miners. But the whore girls are also converting into stupids because they don't read anything and they don't want to know anything of life but they are thinking that prostitution would be life. Therefore mining does not only pollute the environment, but is also polluting the brain of the whore girls. And one can even say that mining is supporting whore girls and prostitution. Oh yes, this society is calling itself as "Catholic" and "Christian". Congratulation. This pleases to the Peruvian President and to other "Catholic" Presidents of South "America" because they don't want to speak with anybody and they only see their calculations on their tables and they only see their projects and nothing of the sociological damage is mentioned. The birds are drinking the water of the polluted rivers and lagoons, or they also drink the alkaline water of the "retention basins", and then the birds of the zone are all killed. There are also indications that miners are converted into gays during mining work - because women are missing. It is like this that there are mines working also in flat region e.g. coal mines. And when there are enough "tunnels" digged out under a village, so it can be that the whole territory is sinking provoking high damage with damaged houses and streets in the village, and all this is almost irreparable. Therefore mining can destroy complete villages, but the enterprise is leaving and does not pay anything. This was told to me by local population when I passed Morococha in Peru by bus. All this damage is paying nobody of the mining enterprises, but they think that they have no responsibility damaging to Peru and to other countries. And the President - not important from with political party - it's not important for him. Add to this smelting minerals is provoking more pollution in the air by the wind and by clouds distributing the heavy metals in other regions contaminating the earth of complete zones with heavy metals and then heavy metal vegetables and heavy metal fruits are growing, and heavy metal cattle is created. Plumb children are growing also, not only in La Oroya, but also in North of Chile and in other locations it is like this. All this damage is never paid by anybody of the mining enterprises but they think that they have no responsibility polluting Peru and other countries. And the president - not important from which party - it's not important for him. Policy is always shouting something about an "investment" by mining enterprises which will be coming from abroad making "investments" and there would be much profit for all of the local population of the mining region. But this is a toxic "investment" that nobody wants and only blind people can shout like this. These blind persons are the persons from the governments. They simply don't protect their countries. Therefore the politicians and the ministers and the commanders with the stupid "Catholic" moms must not be corrupt by mining corporations any more - but they have to protect their country with clean businesses and with a clean economy and with clean tourism, and thereby a clean life is coming out. They must NOT convert good earth into a toxic desert any more. Stop it. We don't accept this any more. And these governments with mining corporations and with their casinos (there are more casinos than libraries in Peru, and also in Columbia it's like this) these governments call themselves "Catholic" and "Christian". Is it "Catholic" to pollute the country and to fraud the population with faked promises? NO, this is corrupt and blind. And we can see that the "Catholic" people with it's stupid Bible is blind - because they don't read any other book. We don't accept this any more. Traveling in Argentina people in Neuquen told me that more in the South of the Argentinian Andes in Esquel a people's vote was organized against a gold mine, and a big majority of the local population said NO to gold mining for not being polluted. The population of Esquel knew to organize their defense and had got the liberty to elect their health. They are not blind any more. And there is more tourism. Tourism and health are worth more than any gold mine. THAT' THE TRUTH, MR. PRESIDENT OF PERU, BOLIVIA, COLUMBIA, ECUADOR, CHILE, ARGENTINA, OF THE STUPID STATES, OF CANADA, OF AFRICA, OF ASIA AND OF RUSSIA. Let mining be and don't pollute environment and populations any more. Use natural and integral production without polluting. And one has to consider that the gold in the banks and of the economy is always in connection with a big pollution. One should not exploit too much from MOTHER EARTH, but the Great Spirit is in every plant and in every being. Therefore wooden jewels are worth more than golden jewels because wood is not polluting.